Why Are We Trying To Enhance GH, And... Is It Working? Why are we trying to enhance GH, and... is it working? Many of us have heard all about the use of growth hormones. However, how many of us know how they work, or why they work? Learn more. TOPIC: Why Are We Trying To Enhance GH, And... Is It Working? Being exposed to the bodybuilding community and all of the current news regarding steroids in sports, many of us have heard all about the use of growth hormones. However, how many of us know how they work, or why they work? Why are we trying to enhance GH? What are the differences between GH and steroids? Human growth hormone has recently become a topic of controversy in the bodybuilding community. Although many people talk about it as one of the factors that will lead to the decline of professional bodybuilding, many people simply do not know what it is. So let's take a second to look at what GH actually is. But, what does growth hormone actually do? There are a couple of things that growth hormone does. First of all, growth hormone raises the body's ability to insert calcium from foods that are consumed into bone tissue. 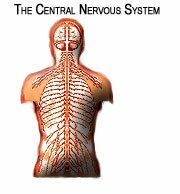 This strengthens the skeletal system, allowing the body to be very much more resistant to trauma. This essentially means that you're less likely to break bones if you've got high levels of growth hormone. The second thing that the growth hormone does in the body is that it increases protein synthesis. Protein synthesis is the creation of new proteins in the body, which leads to new muscle mass, as muscle is primarily made out of protein. What a lot of people don't realize about protein is that the protein you eat doesn't directly get put into your muscles in the same form that you eat it in. When you consume protein, your digestive system then releases acids in addition to an enzyme called pepsin, the acid helps denature (unwind) the protein while the pepsin breaks the protein into small peptides, which then get broken down into smaller monomers called amino acids. These are then built back together by the body, into new proteins, which is the actual synthesizing of the protein. Now, this is a real limiting factor in bodybuilding, and the simple fact that growth hormone increases the rate at which proteins are synthesized, directly means more muscle mass with the same amount of training. The third effect growth hormone has on the body is that it increases the body's ability to release fat from adipose cells into the body's bloodstream. This directly allows the body to use stored fat as energy rather than glycogen, which would keep your body fat at the same percentage. This release of extra fat molecules into the bloodstream adds up to be one of the strongest natural ways to lose body fat. Another thing that growth hormone does to the body, and the last we'll be looking at in this article is it's ability to stimulate the central nervous system, allowing the individual to be much healthier and much more resistant to falling ill to the common cold and even other serious illnesses. As you can see by the effects that growth hormone has on the body, these are some very desirable properties. Who wouldn't want stronger bones, more muscle, less fat, and have a much stronger immune system? Certainly every reader here. So this leads us to ways that we can increase the amount of growth hormone flowing through our veins. Naturally, there are a few things you can do to increase your HGH levels. A few of them include getting good amounts of sleep, resistance training, and cardiovascular activity. Another way to increase amounts of growth hormone is through the proper use of supplements. According to a variety of studies, it is suggested that arginine supplementation, such as the Arginine-Alphaketoglutarate found in many common NO2 supplements, can significantly raise GH levels. Not only that, it can also provide massive pumps during your workouts which will in turn increase productivity in the gym, also raising GH levels naturally through the stress placed on the body. Another method of raising your GH levels through supplementation is through taking a more direct GH stimulator. Growth Hormone, being a naturally occurring hormone in the body is very simply one of the most effective hormones in the body. Since it is a naturally occurring hormone, rather than a chemical that is normally never seen in the body, it is safer, and more effective than chemical supplementation. To essentially reiterate the some of the information above, growth hormone is remarkably effective at not only increasing the size of muscle fibers, it can also increase the number of muscle fibers, which is called hyperplasia. In addition to this, it increases protein synthesis in the body in addition to increasing the rate at which lypolysis occurs in a person's body. Simply stated, growth hormone, or increasing the amount of growth hormone your body can be a very valuable tool that a bodybuilder, or even a person just looking to lose a few pounds of fat while putting a bit of muscle on, should certainly look into for easier gains. Steroids are essentially drugs that mimic or lead to increasing the amounts of testosterone in the body for the sake of much faster muscle recovery. Typically steroids are prescribed to people who have been succumb to an injury and need help in the recovery process. This leads us to why some athletes such as bodybuilders take them. They also want much faster muscular recovery, which allows them to work out and recover much more quickly, allowing them to train two or three times as frequently as us natural athletes. The problem with this is that it is illegal. The real difference between steroids and growth hormone is in the side effects. Although more research is needed, growth hormone has little to no side effects on the body. Steroids have side effects such as severe acne, shrunken testicles, roid rage, and gyno. Now this seems silly to think that you'll turn into a giant from supplementing with GH raising supplements, but if you're worried about it, cycling is the way to go. Keep in mind, that people who suffer from gigantism have uncontrolled amounts of GH due to tumors or improperly working pituitary glands, so remember you have control of how much you want secreted, and can stop supplementing if you wish to. Steroids, or more specifically testosterone; is like growth hormone in the sense that they're both hormones that the body naturally produce. Since these two substances require prescriptions, this shifts the focus of what we are talking about to supplements that aim to raise the amount of either of the two hormones in the body by stimulating the body to create them, rather than doing something like "injecting" them. There are both GH promoting supplements in addition to Testosterone boosting supplements that can legally and safely be taken by the general public. These supplements will aid in your bodybuilding gains in addition to reducing the amount of work needed to maintain the gains you have made. Despite the perception given by the latest articles in the media, the use of growth hormone is nothing new. In fact many top level athletes and bodybuilders have been using it since the early 80's. At that time there was no synthetic growth hormone available so they had to use growth hormone extracted from human pituitary glands... yes, that's exactly what you're thinking, they extracted growth hormone from cadavers, creepy stuff. Besides being a morbid practice it turned out to be dangerous too, since a large percentage of people who used it ended up with mad cow disease... fortunately, this practice came to a halt in 1985. Some bodybuilders and athletes had to resort to using growth hormone extracted from Rhesus monkeys; physicians never used that form of growth hormone. By the early 90's synthetic growth hormone was widely available and throughout the decade the popularity of GH soared... so as you can see GH use has been around for quite awhile and it's not the 'newest Hollywood fad' or the 'latest pharmaceutical edge for top level athletes' like the headlines in the media make it seem. So what exactly is growth hormone? Well... It's a hormone that directly stimulates growth and cell reproduction in the organism (hence its name), it's produced, stored and secreted by the pituitary gland. Unlike most hormones used for bodybuilding purposes, GH is not a steroid hormone, it's a protein hormone made up of a chain of 191 amino acids. Why Are We Trying To Enhance GH? And What Are The Differences Between GH And Steroids? When we think about bodybuilding and athletic performance we immediately think about the testosterone hormone, it has been proven time and time again that those athletes and bodybuilders that have the highest levels of testosterone are the ones that perform better. I believe that the importance of GH is up to par with that of testosterone for bodybuilding and athletic purposes, and consider this: For many professional athletes using anabolic steroids to enhance their testosterone levels is not an option, no way would they risk a million dollar career by getting tested with above normal testosterone levels. Unlike testosterone there's no way to tell if an athlete is using a synthetic form of GH so that's why many top-level athletes use it. We lift weights so we can hypertrophy the muscles (make the cells in the muscle swell up), now consider that GH can actually create new muscle cells, and you begin to understand just how important it is to keep our GH levels high, not to mention that elevated GH levels can help us burn fat for energy and promote protein synthesis and literally make us bigger by making our bones more dense. It's a moot point to discuss the effectiveness of GH. Why would athletes and bodybuilders spend thousands of dollars a month if they saw little or no benefit in GH therapy? GH therapy is much more expensive than other hormone therapies (it ranges from 1k to 30k a month). I believe that a large percentage of elite level bodybuilders use GH; you see one of the side effects of GH is the so-called 'GH gut.' GH increases the size of everything (muscle, bones, organs and intestine). This explains why, from the early 90's onwards, the gut size of the top-level bodybuilders has been increasing. This led some people to say that GH ruined the sport of bodybuilding and that they much preferred the physiques displayed by bodybuilders in the 70's, but consider this: without GH you wouldn't have the mass monsters of today. I knew this 15-year-old girl that underwent GH therapy, she was kind of short for her age and skinny. I saw her a year later when she turned 16 and I didn't recognize her. She was not only taller but she looked much older than 16. She told me GH therapy was h-ll because she had to take injections two times a day and she would have to keep taking those injections for quite some time to come. So if you're not an elite level bodybuilder or a short 15-year-old girl GH therapy is probably not something you would consider. Sleep at least 7 hours. You need rest to ensure proper hormonal production and it is when you sleep that the body is more active repairing itself and producing the hormones you need to grow. Make sure you ingest enough dietary protein and fat, both these nutrients play a vital role when it come to hormonal production. Lifting weights has been shown to increase GH, especially intensive compound movements like deadlifts and squats. Low levels of blood sugar stimulate GH production; you can achieve this by eating low carb or by fasting for a few hours. Arginine has been shown to increase GH levels; try taking a supplement containing arginine before going to sleep. You can also try one of the several supplements that claim to elevate GH levels to see if they work or not, I can't comment since I've never taken one, but hey maybe if I win this! Bigger and better. This is the way of the world, and the mantra of countless bodybuilders and fitness fanatics. With this said, Growth Hormone is becoming increasingly popular for use in the field of athletics. But, the illegality of HGH demands further enhancement of GH (produced in one's own body) with "boosters" or "releasers" available at many supplement stores. The name says it all, growth hormone. This peptide is responsible for signaling growth in the human body — predominantly in stages of life that requires full-body growth (puberty for example). This growth, for the most part, is throughout the entire body — so not only muscles are targeted, but also expect your organs and bones to grow as allowed. For people with GH deficient disorders and the elderly, GH treatment is able to support and promote continued health of muscles and bones. The results are incredible! It has even been labeled as the "Fountain of Youth." GH has given many people in need the ability to grow as youth do. The downside — this form of GH is widely unavailable or VERY expensive for the average bodybuilder. For the most part, pure GH for injection is hard to come by — and in many countries, is illegal for use other than prescribed. However, many products are selling that boost or promote the production and/or release of GH (somatotropin). These are of course, at the discretion of the user to decide whether they work or not. The benefit of these is that side-effects of excess GH are minimal as the GH is produced by the body itself — in response to the stimulators. That said, there are downsides to injectable GH. 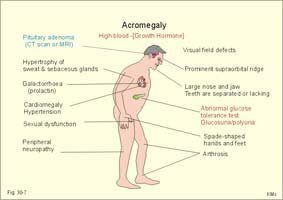 Some of the most famous side-effects include Acromegaly, gigantism, blindness and tumor growth. So, enhancing GH production is a great way to increase GH effects, without the negatives. I suggest to using the GH boosters, as opposed to raw Growth Hormone, to limit the side-effects, and get an overall safer GH experience for mass gains. The creation of synthetic GH is meant as a supplement for those with a deficiency or dire need of the hormone. For an average person, GH is produced and secreted in response to certain stimulus — sleep, exercise and nutrition (the top stimuli) — all things the average bodybuilder will regulate. So, the average bodybuilder will have GH being produced and secreted, unless they are deficient. An excess of GH in the human body can lead to gigantism (a serious disorder), vision loss, aggression and the promotion of cancers and tumors in the body — to name a few. This said, GH might not be recommended for use unless needed, or approved by a physician. However, boosting GH with a supplement may give the gains bodybuilders want, but at a slower, safer pace. For most bodybuilders, the goal is muscular hypertrophy — to increase mass and size of muscle cells. What GH promotes is not hypertrophy, but hyperplasia — increasing the number of muscle cells. While this may appear superficially as an increase in mass — it is actually growth related to more cells being present. One study compared bodybuilders without GH — the same amount of lean muscle mass was gained for those taking GH on a short-term basis. One benefit observed though was that fat loss was greater for those taking GH (Yarasheski et. al.) Thus, GH may be effective for fat loss during training for mass gain. GH and Anabolic steroids are both hormones, but without getting too heavy into the science, growth hormone is a peptide (which are made up of amino acids) and steroids are based on the sterol molecule. Anabolic steroids mimic the hormone testosterone. It's impossible to notice the differences between the 2 substances in liquid form — but your body knows the difference! While both may appear to do the same thing, they do not. Anabolic steroids promote hypertrophy — which is increasing SIZE of cells, while GH promotes hyperplasia — which increases the AMOUNT of cells. Both can have negative side-effects, but as far as most studies show, anabolic steroids are far more dangerous and can lead to more disorders in the future. Yarasheski, K. E., J. A. Campbell, K. Smith, M. J. Rennie, J. O. Holloszy and D. M. Bier. 1992. Effect of growth hormone and resistance exercise on muscle growth in young men. American Journal of Physiology. 262:E261-E267, E268-E276. Growth hormone, known alternately as HGH or simply GH, is a hormone secreted by the pituitary gland at the base of the brain in response to a variety of stimuli. Sleep, if long enough in duration for REM sleep to be achieved, produces a burst of GH secretion, as does body temperature elevation, and the consumption of certain amino acids. Growth hormone utilizes several mechanisms to promote the growth of body tissues; working to directly boost anabolic actions in the body by stimulating an increase in the rate of cellular reproduction, enhancing cellular repair, and promoting the synthesis and secretion of insulin-like growth factors, notably IGF-1. These pathways cause growth throughout the human body. GH also promotes testosterone production, which is something we are all interested in. Once the long bones have reached their full potential and the body's organs have attained their optimal size for function, our bodies tend to use our endogenous GH exclusively to repair damaged tissues, to promote the preservation of glycogen reserves by triggering a metabolic switch to facilitate the preferential use of body fat for fuel, and to maintain a healthy metabolism. However, if exogenous sources of GH are introduced to the body in large doses, it can stimulate the continued growth of bones, organs, and muscle tissue. 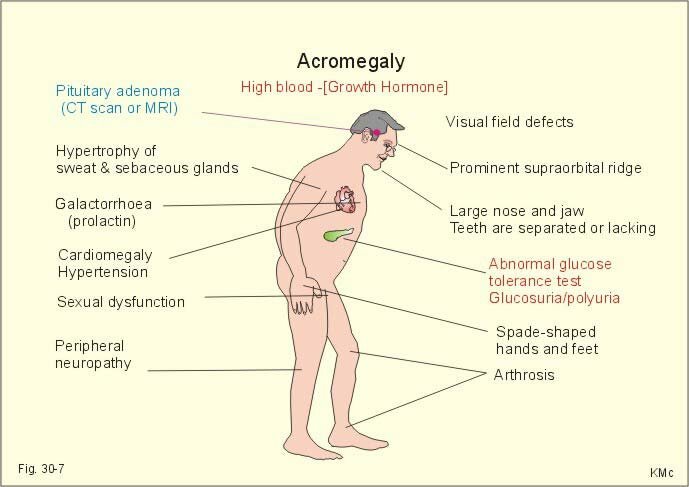 In adults, the long bones have fused, and the additional bone growth will typically cause a thickening of the facial bones and skull, and continued growth of short bones (hands: carpals/metacarpals/phalanges - feet: tarsals/metatarsals/phalanges), causing a condition known as acromegaly. The extra growth of the organs can cause the distended abdomens we have sadly become accustomed to seeing in professional bodybuilders. Enhancing GH Why Are We Trying To Enhance GH?The bodybuilder seeks to increase or enhance the amount, and thus effects, of GH in their system based on two specific actions. First, muscle tissue is effected in the same way as any other tissue, and muscle growth is the primary goal of all serious bodybuilders. The enhanced healing ability, coupled with the increased ability of muscle cells to reproduce via satellite cells creates a powerful environment for increased muscle size and strength. Add increased levels of IGF-1 and testosterone, which work in synergy with GH, and a bodybuilder may create a hormonal dynamo of muscle growth. The second desired effect is the preferential burning of adipose tissue for fuel. The preservation of glycogen is critical not only for cellular energy (think increased intensity), but also for optimal cellular repair and volume (recovery and muscle size/hardness). Not to mention that burning more body fat creates a leaner body. GH Effectineness How Effective Is GH? GH can be very effective. Witness the incredible muscular development of today's professional bodybuilders when compared to the physiques of the champions of yesteryear, before GH was in vogue. While I, like many of my peers, long for the days of Arnold and Haney, there is no denying that since GH has arrived on the scene, the top tier competitors have become much more massive. While the results seen onstage may be a result of synergism between GH and the rest of the pharmacological agents the pros are using, GH is definitely playing a big role in today's bodybuilding world. But results are not limited to large dose injection of GH. Anecdotal evidence suggests that even the relatively tiny dosages of GH found in homeopathic preparations are helping bodybuilders decrease their recovery time. I have also read accounts of L-Dopa rich macuna pruriens supplements helping athletes to get lean. These GH enhancing strategies may not deliver incredible results, but for most of us, every little bit helps. GH vs. Steroids What Are The Differences Between GH And Steroids? First and foremost, GH is natural. While modern GH is synthesized, rather than being taken from cadavers as in the past, the synthesized GH molecule is identical to that produced by our bodies. Steroids are also synthesized, but they are not exact copies of testosterone, the hormone they are meant to approximate. Additionally, steroids are androgenic as well as anabolic. GH has no androgenic actions, thus, it will not lead to the masculinization of the female body or the feminization of certain parts of the male physique as steroids have been known to. Conversely, steroids can be carefully selected, due to their modified molecular structure, to maximize certain aspects (anabolic) while minimizing others (androgenic). Large dose GH will effect all tissues of the body, with no reliable way to minimize its effects on bone and organ growth. Finally, steroids are, as we all know, illegal. Steroids cannot be legally possessed by any person in any amount unless prescribed by a medical doctor. GH is also controlled to a large extent, requiring a script for all but minute doses, such as those used in homeopathic medicine, but it can be obtained legally in such preparations. GH is getting some bad press due to its use by professional athletes. But this substance offers a plethora of benefits to those who use it judiciously. As with anything, moderation is key. One can use GH to cut fat and boost muscle mass while easily avoiding negative side-effects such as acromegaly and enlarged organs. My preference is to give the body every opportunity to maximize its endogenous production of growth hormone through nutrition, supplementation, and regularly producing a hyperthermic body environment through hard training or the use of a far-infrared sauna.